G. Kalaitzidis on being Targeted by the Authorities and Refuting Media Narratives for the Anarchist Collective Rouvikonas. As everyone must have realized by now, the dominant narrative of the media and the entire political opposition is that Rouvikonas enjoys some kind of tolerance from the Syriza- Independent Greeks government. News reports, live shows, a number of politicians in and out of the parliament, but mainly the president of the conservative party New Democracy, have complained with every opportunity they get for the ”unprevented” actions of the anarchist collective Rouvikonas. Recently, the National Federation of Police Officers stated, more or less, that none of us has a criminal record and that the police has never been ordered to search for us. But numbers reveal a different truth which disproves the claims made by all of the above since there have been approximately 100 arrests of members of the group during the Syriza administration. Regarding the issue of convictions, just one example would suffice to get the picture: ten members of the group were sentenced to 350 months in total for our intervention to the Kiato tolls. Of course the issue at stake is different: those who complain about the supposedly ”non-prosecution” we enjoy, know for a fact that there have been arrests and there have been sentences. What they really want is for us to go to prison. 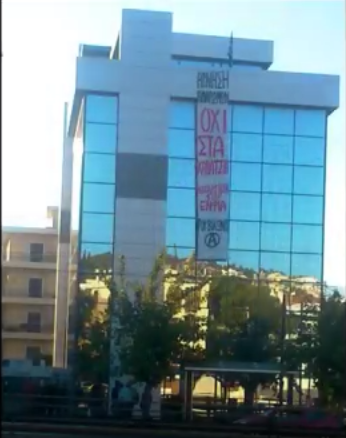 To use a simple example: they expected that we would have been taken to Korydallos following our recent arrests for the occupation of the Spanish Embassy in Athens. Of course there is a solution for everything: a legal change that would turn misdemeanour offenses into felonies. But then nobody in this country will be able to stay out of prison. Speaking from personal experience, there is a huge discrepancy between being described by others as someone who is rolling around carelessly on the green valleys of Syriza’s tolerance and in reality facing constant pressure from the authorities on a daily basis. During the Syriza administration, I have been arrested 8 times and detained approximately 20 times. I am now expecting 6 trials and so far I have been sentenced to 73 months in prison. In some cases, such as the hearing at the appellate court that I have on Wednesday for the attack at the Turkish Embassy, I got arrested because I was identified from video footage due to my ”body type”. During the trial of first instance, they placed a projector in the courtroom which played a video that showed nothing and despite that, I was still ”identified” and sentenced to 6 months in prison. Lately, the pressure has escalated. I have now gotten used to being picked up from the street by the police and led to the police HQ for absolutely no reason at least once a month. This phenomenon has increased in frequency. On the 6th of December, I was stopped by plainclothed cops as I was coming out of my house, right before I got on my bike. I was surrounded outside my home for about 20 minutes, when a police car arrived and picked me up. I was then taken to the 6th floor of the police HQ . There, the superintendent told me that i was not brought in by them but by another service. After being detained for 2 hours, I was eventually allowed to go. The next day, on the 7th of December, I was stopped by the police after getting on my bike and driving a very short distance. I waited surrounded by Dias cops this time and a police car came and took me to the police HQ, again on the 6th floor. After sitting there for an hour, they released me. This is the ”tolerance” I enjoy as a member of the anarchist collective Rouvikonas. Since patience has its limitations, our patience to the lies, misinformation and the pressure from the authorities will come to an end at some point. Next post: #Korydallos: Prison Struggle Continues!